Schön is an old world with a long history expanding into legends and myths. When the foundations of the world were formed and set by the One True God, He blessed it and gifted it to His creations. Dragons were given the Elemental Domains, the reservoirs of primeval power churning around the Sea of Chaos. Elves were given the Feywild, a green and lovely land filled with verdance and wilds. The Dwarves were given the Underworld where riches lay to be discovered. Humans were given the Mortal Lands, the surface of the world, where the beauties of creation converge. As ages passed, the Dragons and Elves used their magic to pass between the veils and the Dwarves dug up from their depths and the Humans learned that there was more to learn and subdue, dragons breached the barriers of the elemental planes, and the Dark Consortium escaped the confines of the Shadowfell. The passing of beings to and fro was not unnatural or harmful to the world, as magic flows naturally from the planes into the Mortal Lands. But those who wield magic soon learned that they could unleash untold power by opening these streams into rivers. And the natural order was wounded. Obedient to Adonai, the One True God, Maran left his home of Galdar and traveled south to Hargad, the land of the giants. Adonai warned Maran of the evils of the giants and told him that He would someday drive them from the land and give it to Maran's descendants. Barish, the grandson of Maran, was taken captive by the giants and sold into slavery in Cathia, on the other side of the God's Wall Mountains. There he was blessed by Adonai and prospered and was able to save his family from the destruction of the Great Dragon-Giant War. Over the centuries, the Marianites lost favor with the Emperors of Cathia and were forced into slavery until Adonai raised a leader among them. Sothis lead her people out of captivity, through God's Wall, and into the Covenant Land. Upon arrival, she had a vision, seeing that there was another flock which needed Adonai's aid. She continued west where she rescued the Mantegan remnant from the tyranny of the Storm Queen and established the Followers of Sothis' Way. Her brother Barid remained as the leader of the Marianites and was crowned king and established the Knights of Baridor. Twenty years after the Marianites entered the Covenant Land, the dragons took notice and began to wage war against them and the great wyrm Pyre burned their city to the ground. Barid gave his life to end this conflict and passed the crown to his so Gelid. During Gelid's reign, his strongest general, Gaul, led a rebellion seeking blood from the dragons and seeing his king as a weakling. But Gaul lost his coup and fled south with those loyal to him to wage war on the ogres and take their lands, forming Dargaul. In Montega, the native humans of the land establish the Council of Clans lead by the King of Owls to protect their resources, being exploited by Baridor, and proclaimed themselves a nation in alliance with Baridor. This was the birth of the Realms of Sothis, later expanded to include the papacy of Galdor, which was ruled by the Church of the Faith. The Realms of Sothis further expanded as the Baridorians conflicted and built relations with their neighbors in Velderia and Nordan (later Nordania). Over recent centuries, the Realms of Sothis—Baridor, Galdor, Montega, Nordania, and Veldaria—have grown in strength and relative peace as Dargaul has festered to the south, beyond the Tower Line. A prophecy promising five-hundred years of peace is approaching its end, though most members of the Faith no longer adhere to a literal interpretation. Once the greatest power between God's Wall and the Andoran Mountains, the Sylvan Dominion was established by the Sons of Erithyl—ten Elven Princes—to guide the growing human populace and protect them from the dragons. They were divided into ten courts: the Ashen, the Beryl, the Celestial, the Emerald, the Hawthorn, the Kestrel, the Wolfen, the Oaken, the Rowan, and the Vixen Courts. Each court was tasked with a region of the Great Forest which once covered most of the Central Lands now known as Thannon. The elves and humans together battled the dragons and drove them out of the Sylvan Dominion, far to the southeast, and there banished the Dragon King back into the Shadowfell from where he came. While the Sons of Erithyl were seen by many as benevolent rulers, there were a growing number of humans who resented the rule of elves. Some of them engaged in open rebellion and fewer still sought the aid of forbidden magics and the Dark Consortium: the Storm Queen, Skeleton King, Swollen Mother, Spider Queen, Fire King, Tree Queen, Ogre Chief, and even the Dragon King. The Dark Consortium and its followers waged war against the Sylvan Dominion, and the Dragon King, still banished, had his revenge when an army of dragons burned the Great Forest to ash. The Beryl, Emerald, Kestrel, and Rowan Courts withstood the end of the Sylvan Dominion, though their forest home was diminished to the Waking Wood, and absorbing a number of the survivors. Others, primarily belonging to the Celestial, Oaken, and Vixen Courts, fled south to establish Feylorn, a guarded forest unfriendly to outsiders. Today most of the Great Forest is gone, replaced by the Planes of Thannon. 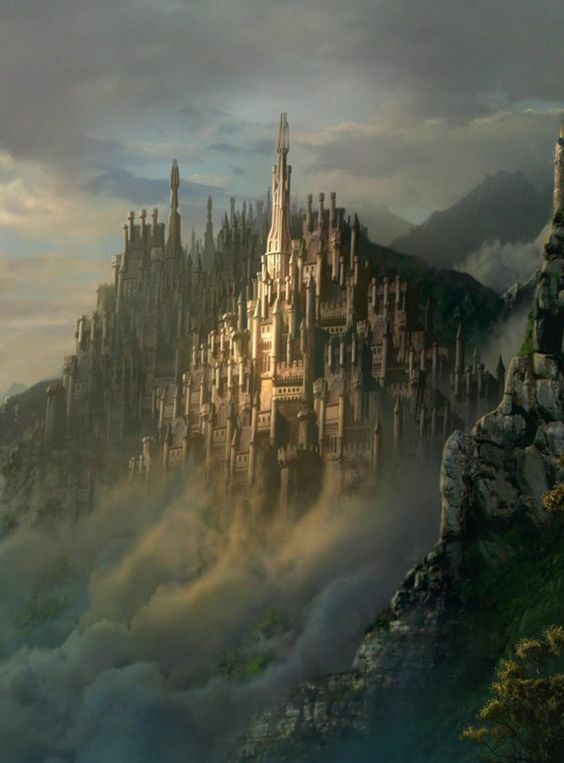 Beyond the God's Wall Mountains—the Eastern Border of the Realms of Sothis—is the Empire of Cathia, which once spread south of the Ragnar Mountains. The Cathian Empire reached the height of its power, stretching east of the God's Wall and south of the Ragnar Mountains as far as Pytes and the Kenawi Jungle. But the death of Emperor Carish the Great lead to the Succession Wars, strengthening the Eastern Empire, but weakening the Western Empire. Little is known of the Empire these days as passage across God's Wall is unheard of. When the Marianites fled nearly five centuries ago the Empire included many races and nations. -612 1 1 Birth of the Sylvan Dominion Elves of the central lands (modern Plains of Thannon) take authority over the growing human populace and set ten kings over them - the Sons of Erithyl. -507 3 11 Maran leaves Ancient Galdar Obedient to the One True God, Maran leaves the land of his fathers to settle in the land of the giants, which God promises will belong to his descendants. -482 7 16 Heshirius crowed (Emerald Court) Heshirius crowed King of the Emerald Court. -420 6 27 Barish captured in Cathia Barish, son of Len, is taken captive in Cathia. Thanks to the provision of the One True God, he prospers and saves his father and family from the destruction of the Great Dragon-Giant War. -360 - - Rise of the Dark Consortium In secret, some humans began to call on the Storm Queen, Skeleton King, Swollen Mother, Spider Queen, Fire King, Tree Queen, Ogre Chief, and Dragon King for aid. -247 3 17 Archidemus reaches Alaria The archmage Archidemus lead a dozen students of the magical arts out of the western Cathian Empire, over the Ragnar Mountains, to what would become Alaria. -243 8 29 Death of Carish the Great The Cathian Empire reaches the height of its power, stretching east of the God's Wall and south of the Ragnar Mountains as far as Pytes and the Kenawi Jungle. But the death of Emperor Carish the Great leads to troubled times. The Succession Wars last twenty years, leading to a strong and consolidated Eastern Empire and a weak and divided Western Empire. -111 3 11 Dark Consortium War Storm Queen, Skeleton King, Swollen Mother, Spider Queen, Fire King, Tree Queen, Ogre Chief, and Dragon King lead their forces against the Ten Kings of the Sylvan Dominion. -110 4 8 Tyriad crowed (Beryl Court) Tyriad crowed King of the Beryl Court. -101 7 16 Burning of the Sylvan Dominion Utilizing a natural drought, an army of dragons laid waste to the great forests of the Sylvan Dominion, and six of the ten courts were reduced to ash. -100 13 30 Ten Teeth Forged Heshirius and Erishel forge the Tierin'Vayn (Ten Teeth) - five swords and five spears crafted to slay dragons. Each was given to a king (or former king) of one of the ten courts. -97 11 18 Death of Heshirius Heshirius was killed by the Dragon King in a great battle. -97 13 31 Erishel crowed (Emerald Court) Erishel crowed King of the Emerald Court. -96 4 8 Dragon King Banished After Erishel and the Elven Host of the Waking Wood drove the Dragon King to Dargaul, Ovelis, Gladriselle, and ten others banish him. This site was called Wyrm'Dwayin by the elves and Drak'Nar by the orges. -7 3 30 Marianites Exodus The Children of Marian leave Cathian captivity and persecution, escaping into God's Wall. 1 5 17 Glimpse the Covenant Land The Cathians and their allies following Sothis have their first glimpse of the Covenant Land. 3 5 17 Barid crowned (Baridor) Barid crowned the first King of Baridor. 3 6 24 Sothis Discovers Montegans Sothis finds the Montegan remnant. 3 10 12 Sothis Defeats the Storm Queen Sothis vanquishes Drya, the Storm Queen. 3 10 19 Followers of Sothis Way established Sothis passes her mantle to Sylian Vale, who becomes the first leader of the Followers of Sothis' Way. She then ascends into heaven on a stag-drawn chariot. 9 13 31 The Dryan Witches rear reality The Dryan Witches begin ripping open the ingresses of magical energies meant to transude into the world - the natural flow of magic. 11 6 10 Sealing the First Wound The Followers of Sothis Way fight against the Dryan Witches and seal the first wound. 12 3 3 The Congress of Witches dispersed The Dryan Witch Queen is slain and the Congress of Witches is dispersed. 12 4 12 Church of the Faith established Sothis' pupils and the Marianite scholars establish the founding principals of the Church of the Faith based on historical documents written by God's people (the Marianites) in the past and the lessons taught by Sothis. This establishes the doctrines and principals on which the Church of the Faith is built, separating it from the historical Marianites. One principal is the inclusion of others (non-Marianites) or the Doctrine of Grafting. 20 4 31 Dragon War begins The early kingdom of Baridor faced its first real conflict when it was attacked by dragons from the south. Wise King Barid knew that not all these creatures were evil and aided by one such dragon he fought against Pyre and his forces. 21 13 10 Burning of Baridor on High The great wyrm Pyre attacked the city of Baridor on High, melting the golden towers and gates of the palace. 21 13 12 Birth of Pyre's Get The great wyrm Pyre used his magic to draw forth elementals from the ash left by his breath and taught them the secrets of the changelings. These creatures are called Pyre's Get. 25 6 21 Dragon War ends The Dragon War ended when Barid gave his life to slay the great wyrm Gloom and maim Pyre, taking one of his eyes. He did this with his faith and his lance, giving to the creed of the Knights of Baridor - "By my Faith. By my Lance." 25 6 21 Death of King Barid Death of King Barid, first King of Baridor. 25 6 28 Gelid crowned (Baridor) Gelid crowned second king of Baridor. 26 3 21 Gaul Rebellion Gaul leads a rebellion against Gelid to seize the throne of Baridor. He wants vengeance against the dragons in the south and claims to have had a vision about conquering that land. 41 2 16 Death of King Gelid Death of King Gelid, second king of Baridor. 77 3 20 Missions to Montega After learning from traders, the Church of the Faith sends missionaries to Montega. 102 11 14 Council of Montegan Clans established Native tribes, beginning to resent Baridorian settlers taking their resources to Baridor and exploiting their ancestral homes, establish the Council of Clans to represent their interests with Baridor. The leader of these proceedings is called the King of Owls. 138 3 2 Montega established The Council of Clans proclaims Montega a nation. 181 10 23 Montega joins Kingdoms of Sothis Montega allies itself with Baridor to become part of the Kingdoms of Sothis. 198 2 23 Daelron II crowned (Baridor) King Daelron II crowned ruler of Baridor. 200 5 17 Galdor established Galdor is given to the Church of the Faith by King Daelron II. 215 10 23 Overiath crowed (Rowan Court) Overiath crowed King of the Rowan Court. 249 13 31 Forbidden War begins Forbidden War begins between Baridor and Alaria. 251 3 10 Baridorian Foothold in Nordan Dealing with Nordic raiders, Baridor sends a legion of troops to protect its northern border. 253 7 14 Forbidden War ends Forbidden War ends between Baridor and Alaria. 255 9 23 Stonemark complete Dealing with Nordic raiders, Baridor establishes Stonemark on the Nordan boarder. 256 8 10 North Reach complete Dealing with Nordic raiders, Baridor establishing North Reach on the Nordan border. 256 12 9 Death of King Daelron II Death of King Daelron II of Baridor. 287 5 11 Rise of Thoringal Baridor finances King Thoringal and his army in their taming of the land of Nordan with a large shipment of gold, weapons, and armor. 298 8 19 Thoringal's Conquest King Thoringal and his army conquer their neighboring clans to bring peace to Nordan. 299 4 20 Nordania established Nordania is established and Thoringal is crowned as king. 299 7 11 Thoringal crowned (Nordania) Thoringal becomes the first king of Nordania. 301 11 4 Oingal crowned (Nordania) Thoringals second son Oingal is crowned king of Nordania. 302 2 7 War of Brothers begins Thoringals endest son Thorindale leads a war against his brother Oingal. 303 6 13 War of Brothers ends Thoringals endest son Thorindale leads a war against his brother Oingal. Both are killed. 303 6 14 Nordania in turmoil Succession wars begin with name claiming the title of king. 326 8 6 Svirindane crowned (Nordania) Svirindane, son or Thorindane, his army complemented by dwarven mercenaries from Mortaar and human mercenaries from Baridor and Velderia, captures the other would-be kings during a negotiations and forces them to recognize his kingship. 330 5 12 Nordania joins Kingdoms of Sothis Nordania joins Kingdoms of Sothis. Knights of the Faith are stationed in Nordania and the years of rebellions are quelled. 388 11 29 Raethier I crowned (Baridor) Raethier I is crowned King of Baridor. His reign will be noted for dogmatic religious zealousness and division within the Church of the Faith. 392 8 12 Followers of Sothis Way denounced The Church of the Faith decrees that the Followers of Sothis Way are a cult and cannot worship in Churches of the Faith. 404 5 18 Montegan Church of the Faith established Montegan Church of the Faith splits from the Galdorian over issues of the authority of the Holy Seat. 411 1 28 Death of King Raethier I King Raethier I dies of illness. 411 2 5 Raethier II crowned (Baridor) Raethier II is crowned King of Baridor. His reign will be noted for religious tolerance. He was a famous philanderer. 414 1 27 Followers of Sothis Way exonerated The Church of the Faith lifts the ban on the Followers and declares them a part of the wider Church of the Faith. 437 6 11 Death of King Raethier II Death of King Raethier II killed by his cousin, Lord Uberis, after learning of an affair Raethier was having with his wife. 437 6 19 Raethier III crowned (Baridor) Raethier III is crowned King of Baridor. His reign will be noted for the unity and nationalistic pride he attempted to imbue into the nation of Baridor as well as increased control over the other Kingdoms of Sothis. 442 2 7 Montega United to Baridor Raethier III comes into conflict with the King of Owls over "unprovoked taxation", but having so many Montegans of Baridorian descent, his pull with the local lords could not be resisted. Promising tax and tariff relief the Council of Clans voted to strengthen ties and their dependence on Baridor, essential becoming annexed in what's called the Edict of Union. 442 2 8 King of Owls Vanishes The King of Owls, head of the Council of Montegan Clans, vanished after Motega was taken over by Baridor. 448 1 21 Vallyn becomes regent (Kestrel Court) Prince Vallyn assumes the throne as regent of the Kestrel Court in the absence of his father, King Vallyr. 448 7 4 King Victor (Victor I) crowned (Dargaul) Victor (later Victor I) crowned King of Dargaul. He ruled with an iron fist and spread the kingdom over the Ragnar Mountains into Nidia. During his reign ogres and those with ogre blood were stripped of their property and enslaved. 452 3 23 Defilement of the Kings' Grove Wyr'Fayn defiles Heshirius' burial place. 452 3 24 Death of King Tyriad Tyriad killed when dragons from Dargaul attack the Beryl Court. 452 3 27 Discovery of Defilement (Kings' Grove) Deakler discovers the defilement of his father and great-grandfathers' resting places. 452 3 29 The Battle of Westfell Ridge Heroes cleverly defeat an encroaching army of Dark Lord Blacklance using the Cult of the Dragon King's own magical weapon against them. Participants in the battle include Prince Deakler and Lady Iris of the Emerald Court, Lords Arcus and Sheidioüs of Arbourest, and Cora Truthwarden. 452 4 25 Arbourest Investigation The Throne of Baridor sends Lord Uthus Bloodstone and Lord Ferus Oakheart to investigate claims that the Dargaulian army has attacked the Elves of the Waking Wood. 452 5 1 Vale of Winters dispelled The Vale of Winters, locked in ice and snow for over a century, is disenchanted when the Great Rime Wyrn, Altherikar Hoarfrost, is slain by agents of the Dragon King. 452 7 16 Tyrial crowned (Beryl Court) Tyrial crowned Queen Beryl Court.